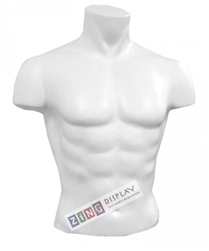 Our 1/2 torso male torso form is perfect for sewing and displaying men's wear. Made of hard foam and covered with off-white jersey fabric. Comes with metal neck cap and your choice of floor or countertop brushed metal rectangular base. To see the matching Female torso form to this male form - click here.